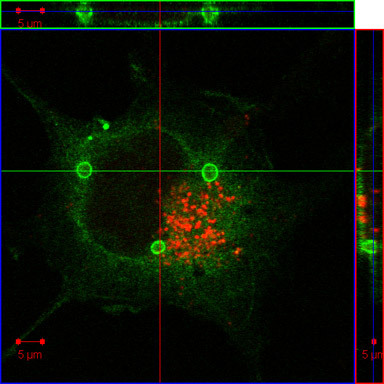 COS cells were labeled with Lysotracker to mark lysosomes (red) and stained with an antibody against TRAF2 (green). We find no colocalization of these molecules at steady state. We study the tumor necrosis factor (TNF) signaling pathway that mediates cellular responses to various stimuli such as inflammation, septic shock, viral infection, and apoptotic signals. TRAF2 is part of the signaling complex which forms after TNF binds to its cell surface receptors. We are interested in how protein function can be regulated by localization. In these images, we find that TRAF2 forms interesting vesicles that are not localized with lysosomes at steady state. We use an LSM 510 which allows us to clearly visualize proteins labeled with different fluorophores. The orthogonal viewing tool also allows simultaneous viewing of the XY image along with a cross section to further examine potential areas of colocalization.